This is one of those 'only in New Zealand' stories. 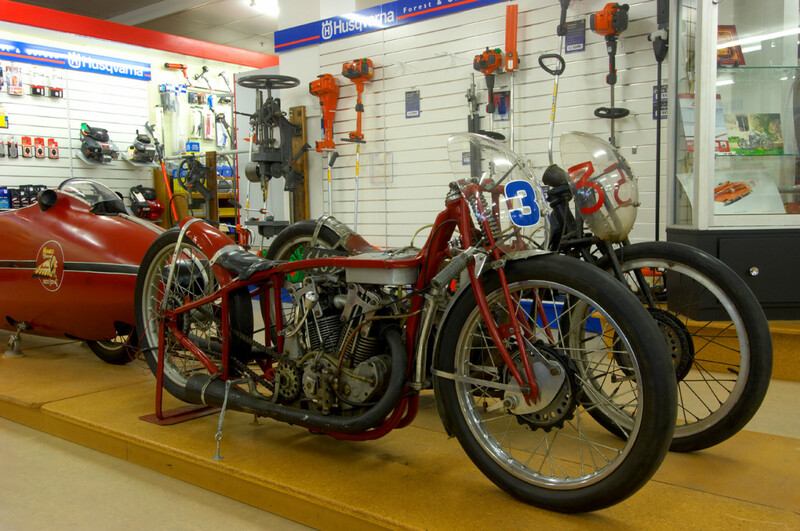 Where else would you find one of the world's most famous racing bikes on display in a hardware store? The history of E. Hayes and Sons Limited goes back to Ernest Hayes, who founded Hayes Engineering Works in the small town of Oturehua in 1885. 47 years later, his son Irving opened the E Hayes and Sons store in Invercargill. The business was then handed down to Irving's son Norman and his grandson Neville, the current managing director. The main entrance of E. Hayes and Sons Limited. Norman was not only one of Burt Munro's best friends, he also paid for most of his trips to the Bonneville Flats in Utah, in the United States, where he ultimately recorded the fastest under 1000cc world record in 1967. When Burt had a stroke in 1977, he sold his motorbike, the Munro Special Indian Scout and most of the contents of his work shed to Norman and Neville, so that they would remain in his beloved Southland. 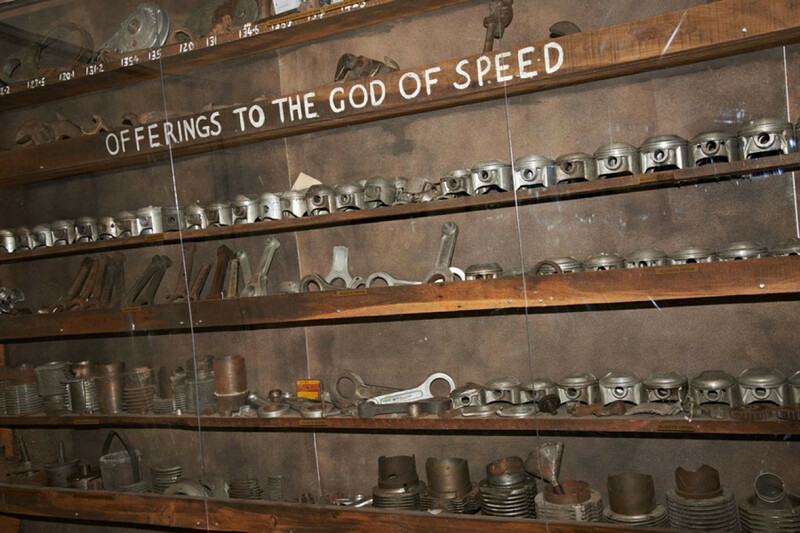 A selection of bike parts Burt Munro sold to the Hayes family. 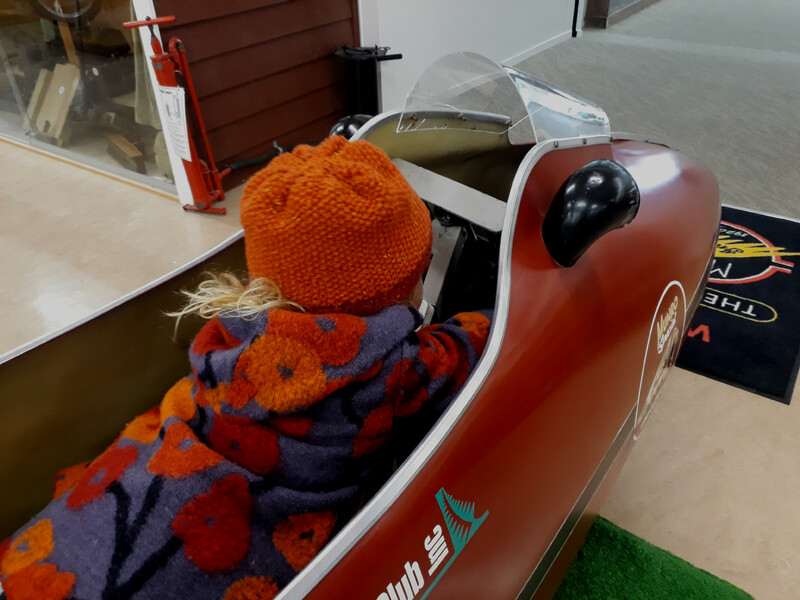 Clearly, Burt's record-breaking Indian Special is the star of the collection, although the store currently displays 56 vintage motorbikes and a number of vintage cars. Interestingly enough, most people don't know that Burt Munro had a second motorbike. It was a 1936 MSS Velocette, which he modified by increasing its engine capacity to 650cc. The bike was also known as the 'Five Pound Velo' because that's how much he had paid for it. Sadly, Burt never managed to take it to the salt lake flats due to his failing health. Burt's 'Munro Special Indian Scout' in situ, but without the streamliner shell. Behind is his second bike, the Velocette. 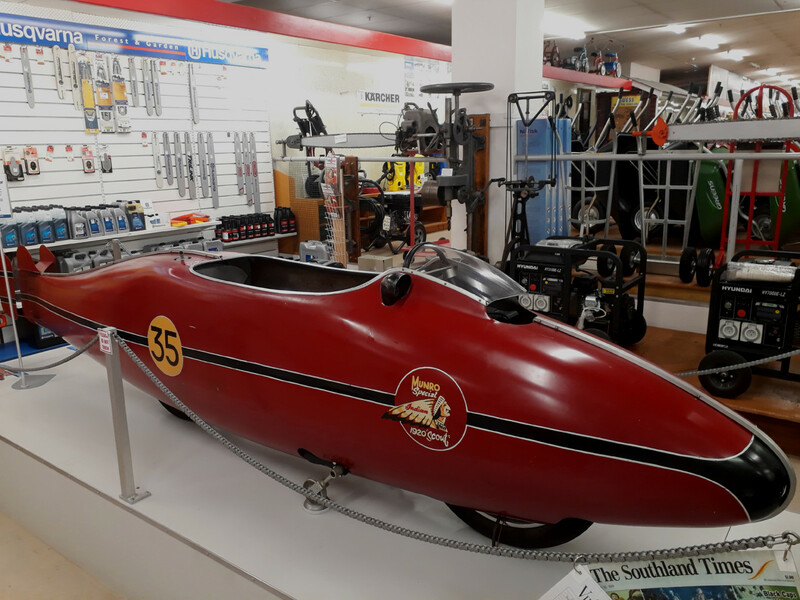 The store also houses one of the motorbikes used in the movie The World's Fastest Indian. Overall, five replicas had to be built for filming. Two of these were transported to the States, while two remained in New Zealand. The fifth bike was constructed without an engine for actor Sir Anthony Hopkins (who plays Burt Munro in the film) to sit in. One of the movie replicas on display. Other props from the movie include the bike trailer and the 1954 Chevrolet car that Burt buys on his arrival in California in order to drive himself to Utah. 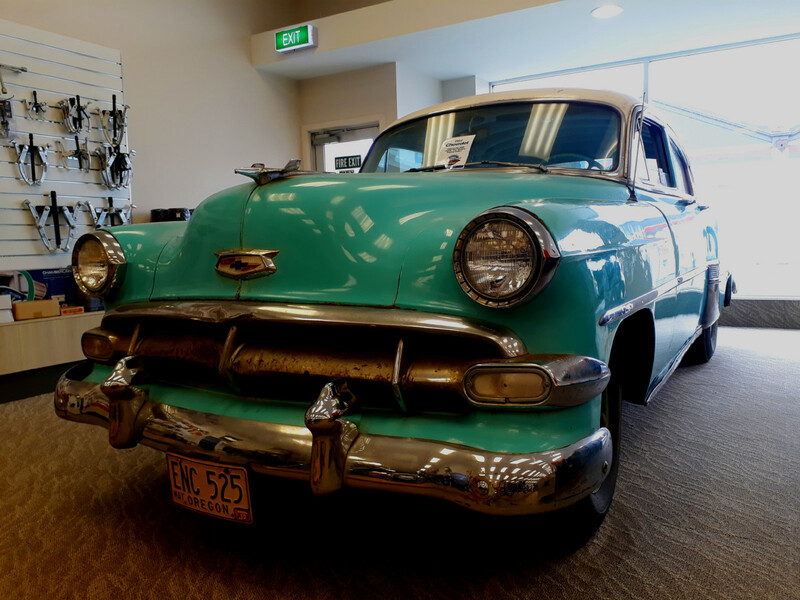 The movie car, a 1954 Chevrolet. But one of the coolest items on display is a replica bike made by the Southland Motorcycle Club. Visitors can sit in it and get a feel for how difficult it must have been for Burt to race in such a tight construction. Of course, we had to try it out, and all I can say is - how on earth did this bike ever stay on track? It's next to impossible to see anything through the front visor. The other thing is that you are basically lying in it, with your feet bent backwards. It's a pretty tight fit, even for our five-year old daughter. In August 1967, Burt Munro set the world record for class S-A 1000cc motorbike, managing an average speed of 184.087 mph (296 kmh). At the time, he was 68 years old and had continuously worked on the Indian Special for 47 years. His record stills stands today. 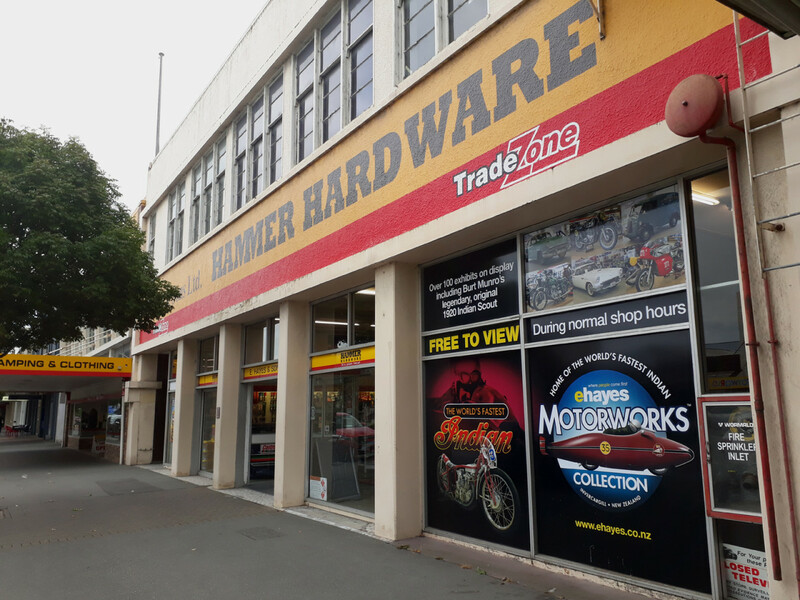 The address of E. Hayes and Sons is at 168 Dee Street, Invercargill. To read more about Burt's remarkable story, the website of the E. Hayes Motorworks Collection is the best place to go. The entry to the collection is free, but visits are limited to the normal shop trading hours of the store. The store also kindly asks for a gold-coin donation to the local hospice if you choose to hop in the replica Indian.